When you set out on a garage makeover, you have two goals in mind. You first want to make your garage more functional. But, you want to make your garage space beautiful as well. When you sit back and think about your dream garage, more than likely one of the things that you dream of is custom garage cabinets. High end garage cabinets may not be something that you have given a lot of thought to. After all, most people would be content with just going to their local home improvement retailer and buying modular shelving units, or prefab cabinets such as those from Craftsman or Rubbermaid. However, we ask you to think about why you would want to spend money on something that isn’t designed with you and your needs in mind. Custom garage cabinets allow you to design a storage and work space solution that meets you needs now and down the line. The best part is that you can choose from a wide range of styles and models to get the perfect cabinet solution for your unique needs. 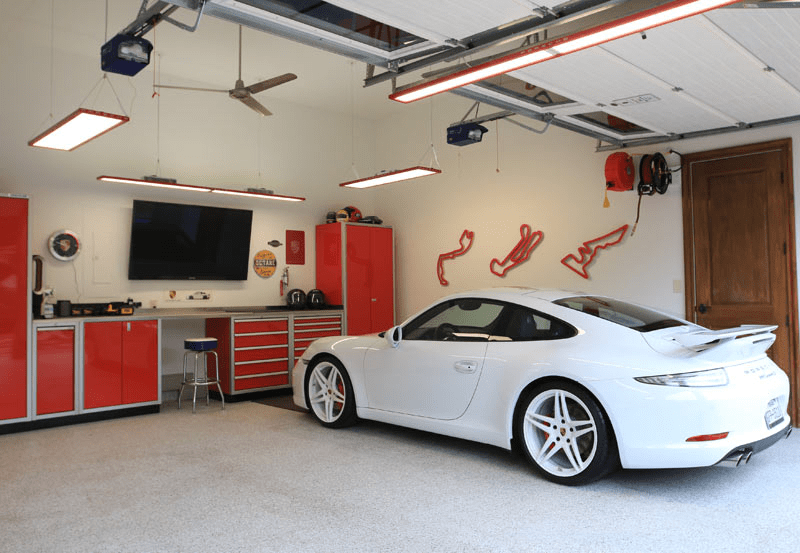 Custom units not only fit perfectly into your garage space, but they also offer you a range of options that ready-made units don’t usually provide. Would you be satisfied with a ready-made closet storage solution for your home? Why then would you be willing to settle for a ready-made garage solution? Some of the specialty options that you may want to consider when you start looking at custom garage cabinets are things which can make your everyday life easier and more convenient. Specialized utility drawers and bins for organizing all kinds of small to medium sized items. A colorful backsplash in your favorite colors, or perhaps featuring the colors and logos of your favorite sports teams. An abundance of power strips with ample outlets. Some strips can even offer you USB ports for charging portable devices such as laptops, cameras, phones, MP3 players, tablets and more. Hidden lighting in and under cabinets, valance lighting, LED lighting, and more. Some options can even include accent lighting in neon or florescent to bring a new level of style and beauty to your one of a kind space. TV install options with protective enclosure and other entertainment system options. You may even want to consider a fold away laptop workstation on one of the countertops to make your space more productive. Of course, the main point of high end garage cabinets is that they help you to keep your garage space more organized. 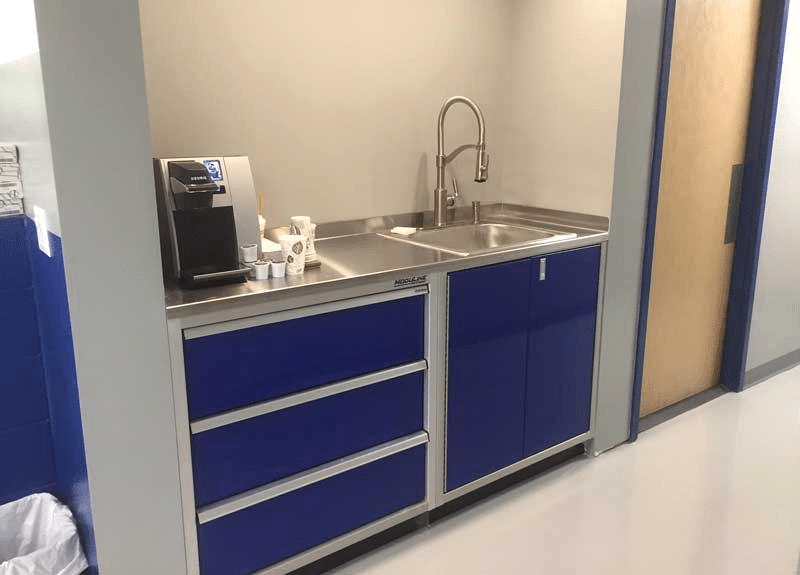 Options such as Instant Walls, mobile tool boxes, parts bin cabinets, recycle-waste bin cabinets, and more can make your space flow easily from one task to the next. While not every option is available in every lineup that we offer, most are. Unparalleled quality, top notch construction, and of course our exclusive lifetime warranty. The all aluminum PROII™ Series is our flagship product, and the most versatile of what we offer. The line is fully customizable and offers all of our best options. You have it all here from cabinets to closets, tool and storage drawers to racks and wall storage options. This line offers fully assembled cabinets. A great choice for those who may have a tight budget is the Select™ series, a professional quality cabinet system that offers many of the key elements of our PROII™ series and packages them in a budget friendly value focused system. Main features that make this system so popular are the soft close hinges, the full 6” Toe Kick Riser, and a fully adjustable shelf system. The sleek color match frames and easy installation procedure make this an ideal choice for any home garage big or small. 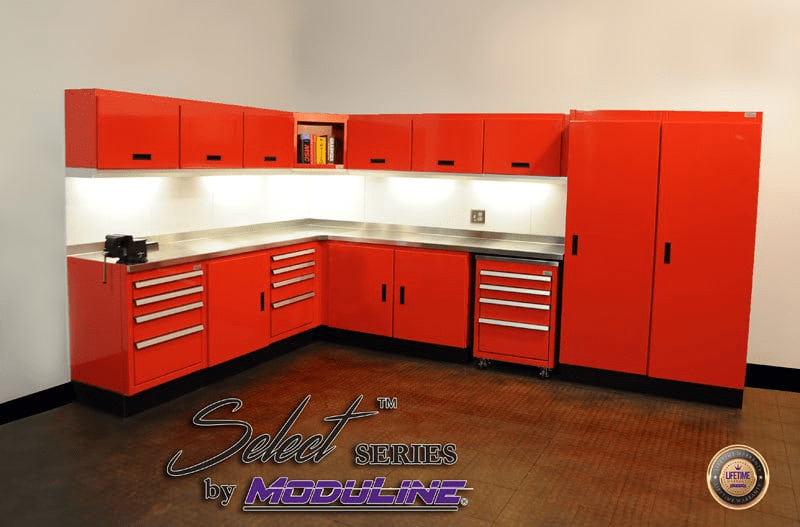 All of the cabinets in this series can be installed on the Moduline Instant Walls System, which makes installation a breeze without having to worry about finding studs, placing cross bars, or making sure that you line things up exactly. No matter if you choose the Select™ Series or the PROII Series, you can be assured that your new cabinets will have the quality workmanship, and materials that you deserve and expect. Choosing to have new cabinets for your garage is a great way to increase the storage efficiency of your home, increase your homes, value, and make your everyday life easier.